Box-elder Sunset, originally uploaded by Tom Arbour. Wednesday evening I made it home before Megan and I had a few minutes to crab the cold weather gear, the camera, and head down to the river. What a beautiful sunset we had this evening. I kept my gear light by only with only my 60 mm lens attached to the camera. Having only one focal length allowed me to concentrate on shapes, composition, and the isolation of features silhouetted against the pink sunset. In this picture, I'm standing in the thick mud of the shore of the Olentangy, pointing the camera slightly up towards a box elder tree. It is interesting how the peduncles of this tree are still attached, although the helicopter shaped samaras have long blown away. Box-elder is one of our forgotten maples. The leaves are divided into three leaflets, looking more like poison ivy than a maple tree. But the fruits give them away. Another giveaway? This trees twigs grow opposite from each other, although there are certainly twigs in this image that break the rule. It will not be long before this tree sprouts new green peduncles with yellow green flowers, and the cycle will begin again. Spring, if you are reading this, I am ready for you! Today Megan and I are at my "childhood" home in Munroe Falls, Ohio, near Akron. We'll be joining my family and friends today on trip on the Cuyahoga Valley Scenic Railroad. The train travels along the Cuyahoga River Valley towards Cleveland through the Cuyahoga Valley National Park, and you can be sure that I'll bring my camera. Also, it is a big weekend in the Arbour/Thomas household. My mom's father, my grandfather, turned 88 on valentines day! My mom's birthday is two days later, today, and she is 58 great years today. And last but not least, yours truly was also born on this day in 1979. Yep, that's right, I was my mom's birthday present. It is quite nice to that we share the same birthday weekend. So happy birthday to my Grandpa and my Mom! very cool photo and happy birthday for sure! Sometimes it is always best to get outside when you have an unplanned trip! We share the same birthday but I'm 1972! How weird! I was meant for Valentines Day, but late as usual! Wonderful sunset photo! It sounds like a nice trip you're having. What a gorgeous sunset capture. You have such an eye!!! Megan is beautiful in the photo below. Wild wave to both of you. WOW! That is an amazing sunset! Absolutely gorgeous. Tom, thank you. I had a great birthday. Chris, that is pretty cool! I was meant for March, but I was two weeks early! Thanks JJ. The trip was fun, but not quite as spectacular as Agawa Canyon! Lovely photo! 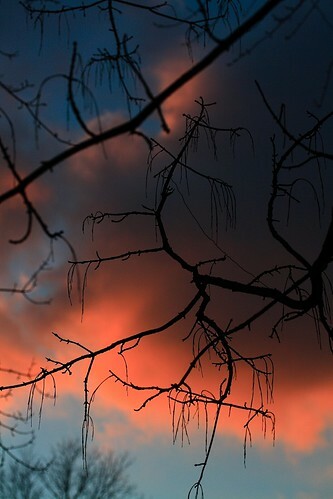 I like how the silhouetted branches in the foreground give it additional texture.